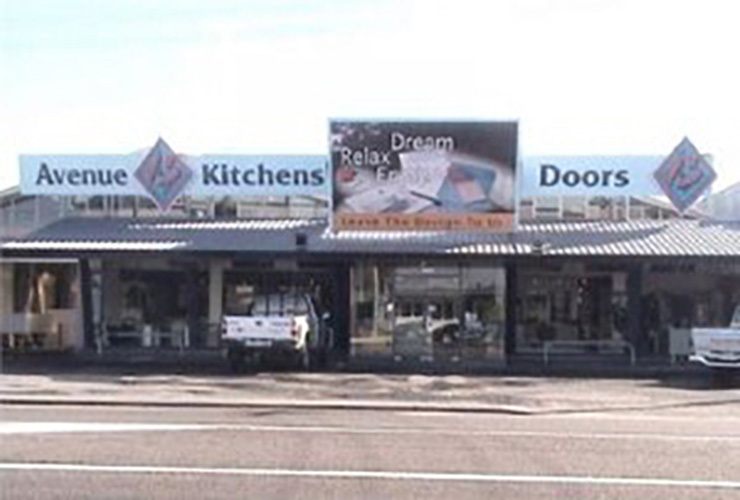 Door Emporium was established in Tauranga as a subsidiary of Door Styles (Hamilton) to support the need for a quality door pre-hanger during the building boom in the late 1990’s. It’s location was a small factory at 113 Maleme St Greerton. In 2004 Door Emporium moved to a larger premises at 100 Maleme Street. In 2006 a dedicated focus was undertaken to establish a balanced portfolio of Residential, Commercial and Industrial clients. This business initiative occurred in parallel with a reduction in the supply to Group House Builders resulting from high volume, low margin competitors fighting aggressively for the group house market. During this period Door Emporium grew significant rapport with the Boutique Residential and Specialised Commercial contractors. In 2008 we introduced our “Green Doors” initiative along with our Green Logo/icon. The Green Door focus has enabled us to demonstrate our support for sustainable resource management and provide specialist expertise to those working to achieve Green Star certification during construction or refurbishment. Like all our peers in the building industry, 2008 through 2009 was a difficult time. Building consents dropped significantly and builders turned their skills toward anything that could keep them going. Demand for Doors dropped and we re-evaluated what we could do to help us maintain a point of difference. The result was our Cellar Door range which led us to the full “Creative Door” focus and the release at the 2009 Auckland Homeshow. At this point our team reflected a combination of skills and staff that had worked for all the historic pre-hangers in our region. In December 2010 we held a year-end celebration to honour our builder clients and focussed on “giving away” a wide range of items that were offered by our supporting suppliers. The primary gifts (drawn by ballot) were a major hamper (girls prize) and a fishing rod/reel (guys prize). A 3rd recessional dip was experienced in early 2011 and required us to reduce staff to remain viable. This 3rd recessional wave was more severe than the first two. Further Operational and Production efficiences were achieved in this period. Over the years between 2011 and 2014, OpenDoors and Tasman Interior Doors continued to grow to supply many of the Group Home Building companies and local builders with their pre-hung doors. Over this time, our area of supply extended to Waikato, Auckland and the Coromandel Peninsula. In 2015, we focussed on efficiency and improvement – LEAN Manufacture Principals were adopted and a CNC machine was installed to improve quality. OpenDoors NZ Ltd continues to respond to the the dynamic of an everchanging market and economic situation. As we do our story keeps unfolding. 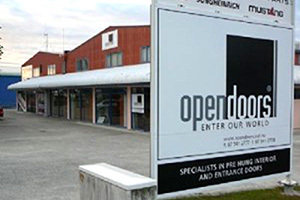 In April 2007 our name was changed to OpenDoors NZ Ltd. This name and its’ associated black & white logo/icon better reflected the wider NZ market, specific clientele and new business direction. In June 2010 (after 39 years providing service to the local industry) Avenue 15 Doors was integrated into OpenDoors. Again, the benefits of the combination of skills, buying power and market relationships has enabled us to provide better value to all our customers. In April 2011 we realised that the combined companies each had individual relationships with clients on the Coromandel Peninsula, however, we were not supporting the region well – hence a dedicated effort to re-establish our relationships was put into practice. In July 2011 our branding transitioned to Black/White colours and Tasman dropped the Blue from its logo. In 2014, The BarnDoors division was introduced as a ‘trial’ project. With a very small investment, we worked with local metal fabricators to develop a product that replicated the old exposed sliding track system. This concept idea hit the market, and gained popularity very rapidly. Our BarnDoors division grew extensively in 2015-2016 as our product gained exposure with TV coverage on DIY programmes. © OpenDoors Limited 2015. All rights reserved.